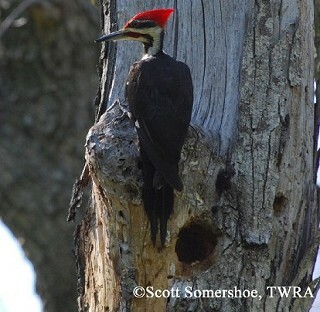 The Pileated Woodpecker is the largest woodpecker in North America (with the exception of the Ivory-billed Woodpecker). Its loud ringing calls and distinctive plumage make it a familiar bird in rural Tennessee. The Pileated Woodpecker is non-migratory and can be found in deciduous and coniferous forests across the eastern half of the United States, central Canada, and south to California. Description: This crow-sized bird has a black body, a red crest on its head, and a broad white stripe on the face extending from the base of the bill down the neck. In flight, the top of the wing shows a patch of white at the base of the primaries, the underwing linings are white, and the trailing edge of the wing is black. The bill is thick and silvery gray. The sexes are similar; however the male has a red crown and forehead and red in the black mustache stripe. The female has a gray to yellow-brown forehead and no red in the mustache stripe. Voice: The call is a boisterous outburst of notes changing in pitch, loudness, and rhythm. Northern Flicker calls resemble those of the Pileated, but are more monotonous and do not change pitch, volume, or rhythm. Habitat: Found in largely forested regions of deciduous or coniferous forests with large trees. Diet: Insects, primarily carpenter ants and wood-boring beetle larvae, fruits, and nuts. Nesting and reproduction: Long-term monogamous pairs stay together on territories year round. Egg laying in Tennessee occurs from early April to early May. Incubation: Both sexes typically incubate the eggs for about 15 to 18 days. Fledging: Both adults regurgitate food for the young, which leave the nest after 24 to 28 days, but may stay with the parents for another 2 to 3 months. Nest: The same nest tree may be used for several consecutive years, but a new nest cavity is excavated every year. Both adults dig the nest usually in the main trunk of a tall dead tree, and excavation can take up to 6 weeks to complete. In Tennessee nest heights range from 18 to 85 feet with an average of 35 feet above the ground. Status in Tennessee: Fairly common permanent resident throughout the state. Populations appear to be stable or increasing. Pileated Woodpeckers play an important role within their ecosystems by excavating cavities that are subsequently used by many other species including birds, small mammals, reptiles, amphibians, and invertebrates. The oldest known Piliated Woodpecker in the wild was 12 years 11 months old. Best places to see in Tennessee: Found in woodlands across the state. Bull, E. L., and J. A. Jackson. 1995. Pileated Woodpecker (Dryocopus pileatus). In The Birds of North America, No. 148 (A. Poole and F. Gill, eds.). The Academy of Natural Sciences, Philadelphia, PA, and The American Ornithologists' Union, Washington, D.C.